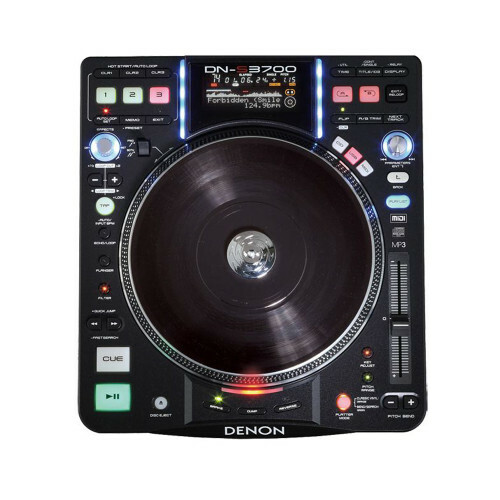 The Denon DN-S3700 Direct Drive Turntable Media Player and Controller is a solid, single-deck portable DJ instrument that provides working DJs with a host of useful features for enhanced creative flexibility. Most notably, thanks to its large 9″ spinning platter design, the DN-S3700 literally offers the “best of both worlds” from both digital and analog realms. In addition to a host of advanced digital features, including USB and MIDI control, the sleek and elegant media player includes a built-in authentic vinyl record for surface control driven by Denon DJ's High Torque Direct Drive motor. This provides users with the classic and unmistakable feel of true vinyl. Categories: Audio Rentals, CD+Media Players, DJ Gear. 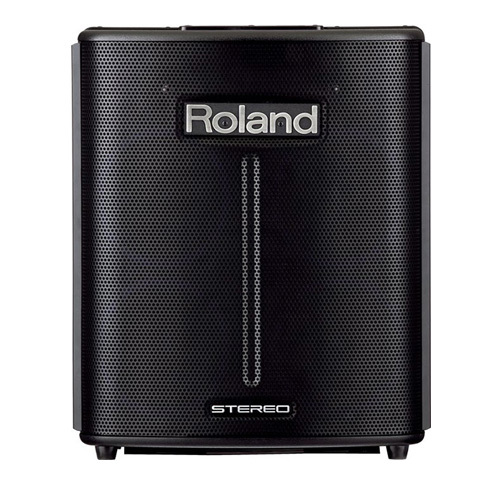 A 9″ spinning platter, USB and MIDI controls, fast-loading slot-in drive, 5 DSP FX, and more. 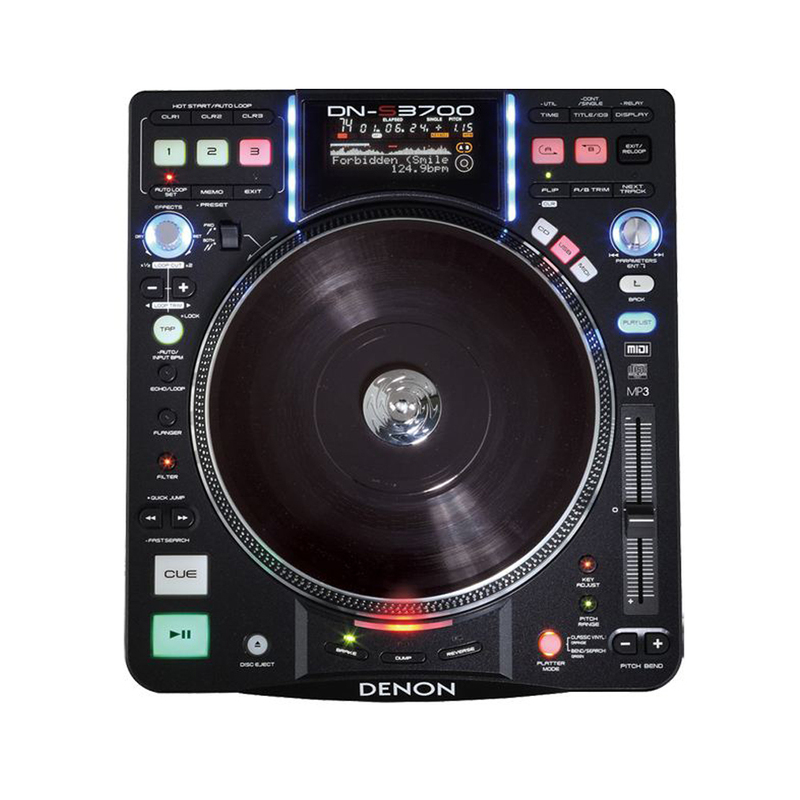 The Denon DN-S3700 Direct Drive Turntable Media Player and Controller is a solid, single-deck portable DJ instrument that provides working DJs with a host of useful features for enhanced creative flexibility. Most notably, thanks to its large 9″ spinning platter design, the DN-S3700 literally offers the “best of both worlds” from both digital and analog realms. In addition to a host of advanced digital features, including USB and MIDI control, the sleek and elegant media player includes a built-in authentic vinyl record for surface control driven by Denon DJ’s High Torque Direct Drive motor. This provides users with the classic and unmistakable feel of true vinyl. 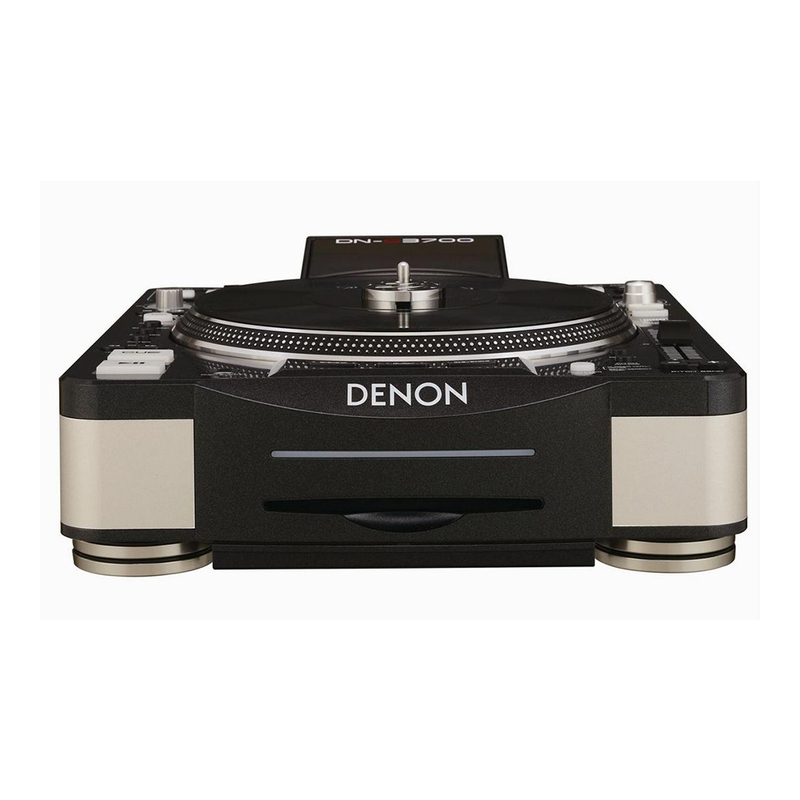 Denon’s proprietary 12-pole Direct Drive brushless motor design is keeping the art of the 110-year-old turntable alive & true to its native feel, delivering instant, full-rotation speed with a powerful 2.5 kg/cm of start-up torque within 0.5 seconds for true turntable reaction and response. 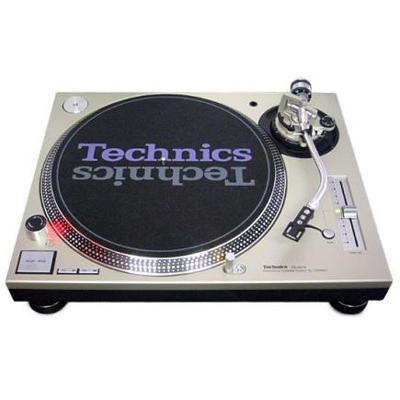 DJs can perform freely on this 9″ platter design mounted with a real vinyl record as if they were using a genuine analog turntable. Platter rotation can be changed between 33 and 45 RPM for comfort. The illuminated, fast-loading, quick-reading slot-in drive reads and supports standard compact audio discs and MP3 discs in a variety of formats: CD, CD-R, CD-RW, CD-ROM. Compact Disc CD-TEXT and MP3 ID3 Tags on CD-ROM are also displayed. With easy access to the Internet these days, many DJs are shopping from home, purchasing their music collection online and storing these files on to a hard drive. The DN-S3700 is well equipped for the modern DJ and conveniently supports external USB mass storage class devices (USB Hubs are not supported). Connect your iPod (mass storage class iPods only), thumb drive, and large hard drives for easy access to your small or extensive MP3/WAV libraries up to 50,000 files. 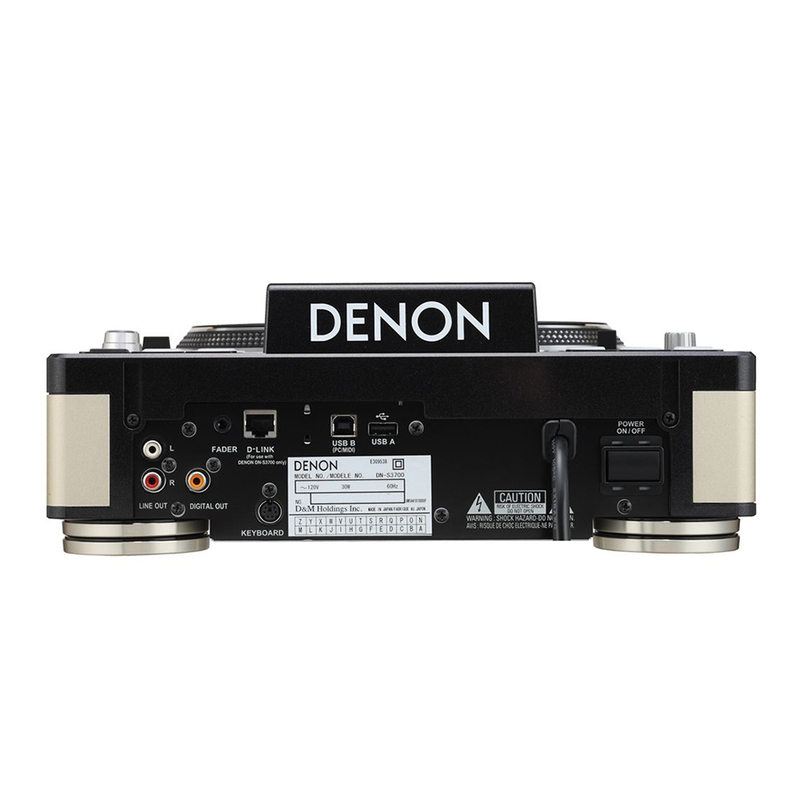 Simply plug any one of these devices into the Denon DN-S3700 to obtain the powerful on-board features such as, Instant Start, Auto Looping, Hot Starts, Effects, 8 ways to file search, and so much more. The DN-S3700 is also designed to interface & control a variety of popular audio/video DJ software applications that support USB MIDI interface, either by user-custom mapping or direct native support by the software vendor. Control your favorite DJ software all from one clever compact player. Supported platforms include Mac OSX 10.4 or higher, Windows XP SP2, Windows Vista. Unlike most dedicated DJ MIDI controllers that are only USB bus-powered, the DN-S3700 encompasses its own internal power supply to achieve the highest electrical specifications, resulting in best possible audio performance. It features high-end Burr Brown (a product of Texas Instruments) 24-bit DAC processing for superior output audio fidelity. The USB Audio interface includes 2-channel stereo output pair, 44.1kHz sampling range and low-latency ASIO/OSX Core Audio support. An ASIO driver is included on the installation CD-ROM. Building the mood, adding energy, and remixing live for your thumping dancefloor has never been so easy with our crystal clear on-board DSP effects. Easily activate and have full parameter adjustments with a unique dry/wet mix control of the BPM sync’d effects: Flanger, Filter (High-Mid-Low), Echo, and Denon DJ’s exclusive Echo Loop. which indicates various energy peaks within the music file. Additionally, a break-point area can be pre-determined and viewed on the S3700 display. Both the waveform and breakpoint data can be set when using external USB devices by using the included Denon DJ Music Manager PC application. A visual 32-position Marker Point indicator follows your hand movements at lightning speeds without drift. Other indicators include Looping, Hot Starts, BPM info, Elapsed/Remain Time, MP3/WAV file types, and other useable indicators. Only FAT, FAT16, and FAT32 file formatted USB devices are supported by the player.